Walk, run, or strut with #teamwar in the annual Gazelle Girl run as we strive to raise $50k for our Rescue 911 fund! The theme is “Our Sweat for their Tears.” We run to raise awareness and to support men, women, and children trapped in the bonds of exploitation around the world. There will be three options for this race: a 5K, 10K, & half-marathon. Prizes will be given to those raising over $100, $250, $500, & $1000 in sponsorships. Check out our fabulous prizes below! Sign up for Gazelle Girl by following this link and using code: GGWARTEAM17 to receive $5 off registration. 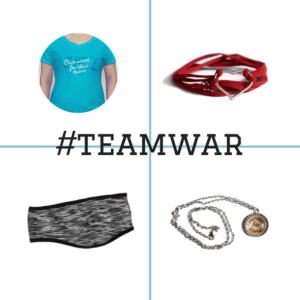 Join our free Team WAR page by following this link. All you have to do is join our team and set up your fundraising page. Don’t live in the Greater Grand Rapids Area? You can still run in a race near you that weekend and raise money for Rescue 911! You can also create your own race that weekend. If you will be participating in a race outside of Gazelle Girl, skip step 1 and go straight to step 2. We will be with you every step of the way as you raise funds and train for this awesome race! Call us at 616-855-0796 if you have any questions. Make sure to like our Facebook page by clicking here.